Clevis Pins are a type of fastener or clip that will allow the swivel or rotation of the parts connected around axis of the linkage of the pin. When using a fastening or clip, like a clevis pin, the hole which is at the opposite end of the pin to the head is inserted through the items to be linked, and then a cotter pin, R clip or similar retaining fastener is inserted through the hole to fix the clevis pin in place. A clevis pin, sometimes called a clevis pin retaining clip, hinge pin or link pin, consists of a shank, cross drilled hole and a head. Simular to a set screw, clevis pins are often used to keep two pieces from moving relative to each other. Our stock of ISO 2341 clevis pins in a variety of materials including mild steel (zinc plated), stainless steel A2 and stainless steel A4. We are also a UK manufacturer of non-standard custom-made clevis pins, which can be manufacuted to customer specifications or drawing. We can produce clevis pins with a large head diameters, and manufacure the hole size and grip length to suit your requirements. 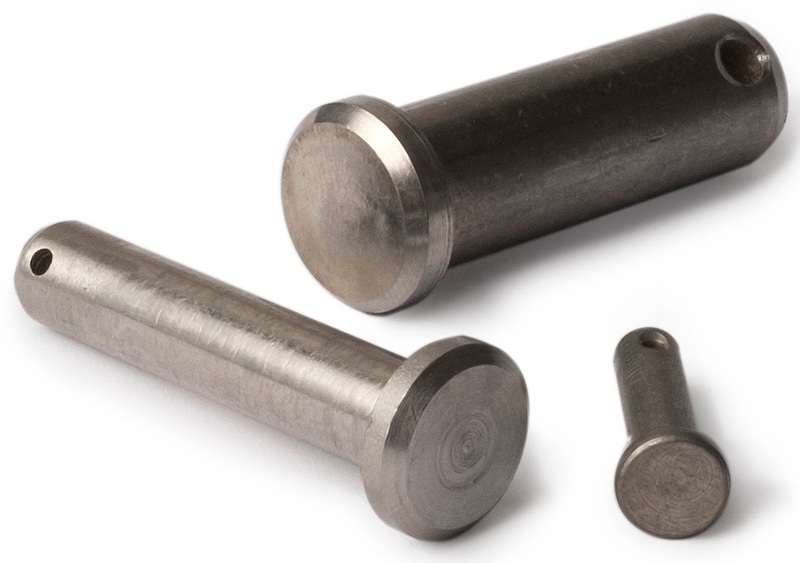 Our manufactured clevis pins are all turned, rather than headed, to provide a superior finish.